Bonnie Angelo meant well, of that I am certain. But when you read her book, you get the distinct impression that she spent a lot of time in the library scribbling down each fact on a 3x5 index card, like they teach you to when you are writing your first research paper in junior high. Then, in a tragically parallel junior high moment, as she gathers her cards and heads for the door, someone bumps into her and the cards scatter across the carpeted floor. The difference between Bonnie Angelo and a junior high student is that someone would make the student put the cards back in order. Angelo proceeded to write her book proceeding from fact to fact in a series of non sequiturs. The chapters, though it seems she meant for them to be grouped by type of story, are each a jumble of facts. It is the reader's responsibility to see how the connect with each other. Although, to her credit, Angelo does throw in the occasional attempt at a transition; if only they weren't so awkward feeling. Because of the scattered nature of the writing, readers are brought back to the same story multiple times as it is used as a connector or it once again connects to another historical anecdote in a minor way. There was a lot of great information in the book. I have been a history buff and lover of presidential history for decades (picture me spending hours with an encyclopedia of presidents as an elementary school student) and there was still plenty of information that was new to me. 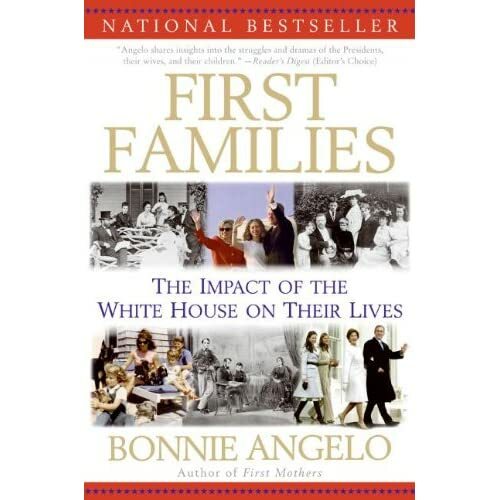 The book focused on the wives and children of the presidents; the only stories about the men themselves came in conjunction with stories about their families. It was a fresh look at presidential history and there was a lot to learn, to be sure. I simply wish that Angelo had organized all the information differently. Had I been the author, I would have arranged it chronologically rather than categorically. I would have rather seen all of the information on the Polks in one place, rather than bits and pieces scattered throughout each chapter. So, Ms. Angelo, thank you for the history lesson. Next time, though, please get your notes in order before sending your work to your editor.